CeCe Teneal - "Eleanor Rigby"
Mike Ragogna: Richard, how are you? Richard Thompson: Doing well, Mike. 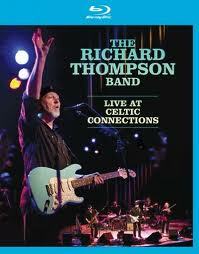 MR: Richard, your new DVD, The Richard Thompson Band - Live At The Celtic Connections, is based on your album, Dream Attic, a collection of live performances that you did here in the US. I think this is a first, basing a live DVD on a live album, not the other way around. What was the thought behind doing a project this way? RT: Well, sometimes, fans come up to me and say that they enjoy my studio albums, but they really prefer to see me live. They thought the songs sounded better live. I thought if they were right, we should change the process and record a live show of all new material, and that's what we did. We recorded eight nights on a West Coast tour in the States and that became the Dream Attic album. I think it turned out fairly well. I'm quite pleased. MR: Can you tell us about the shows on that tour? RT: We had the band out on tour, as one does, to support the record. We were playing at the Celtic Connections Festival in Glasgow, which is a wonderful festival that's been going on for at least 20 years now. I've already played it five or six times. Glasgow is always an interesting audience, they're the best hecklers in the world. (laughs) You have to be on your best behavior and have your wits about you when you play there. (laughs) Anyway, that tour was a way for us to do the live album of our live album, you know? I suppose to be really perverse, we should now go into the studio and do the studio version of the live album. MR: And then put all three together as a deluxe edition and release it with the demos. RT: Always a good idea, but I think the demos have been released already. They were released as a sort of two-for-one package. There was an option to buy the bundled demo package when you purchased the album. MR: And Dream Attic went on to be nominated for a Grammy. RT: Yes, it was. That's always very nice. MR: But, of course, this wasn't your first nomination. You were also nominatedyou're your album Rumor and Sigh. RT: Yeah. A nomination every 20 odd years is fine. That's good for me. MR: (laughs) Let's not forget your winning the Les Paul Award for Guitar Legend. RT: Well, it's nice to get awards every now and then, but it's not always accurate. I mean, "Guitar Legend"? What does that mean? I hate comparisons between guitar players because there are so many great guitar players out there. It's nice to be recognized, but it's not at all what makes me get up in the morning. MR: Let's talk about some of the songs on the DVD, maybe starting with your rocker, "Can't Win"? RT: That's a nice song to jam over, it has nice changes. It's a song that originally appeared on an album about 20 years ago, but it's one that we revive from time to time in live shows because of its instrumental possibilities. MR: Your Live At Celtic Connections DVD included all of the songs from the live recording of your live album as well as some of your older catalog. How did you go about choosing the additional material for the show? RT: I think the idea was that because we played 9 or 10 tracks off of the new album. We wanted to leaven that a bit with a selection of our older material. We tried to come up with a collection of songs that we thought would be interesting to the audience - things that they were familiar with and some obscure things that not everyone would know. We tried to do some things that had not been revived on stage in a long time. MR: Right, songs like "Wall Of Death" or "Tear Stained Letter" that are considered Richard Thompson "classics" by this point. RT: I suppose they're classics. (laughs) I lose a little bit of perspective. When you say words like "classic," I do sort of a little double take. But those songs do get requested quite a bit. MR: Was ...Celtic Connection compiled from different performances? RT: That's the only recording. That was the night that the video company wanted to record it, so we had no choice. They asked us if we wanted to have the show recorded and we thought that we should do it because there would be no down side to having a live recording. All we had to do was play the show. We probably had power of veto over releasing it or not releasing it. There might be a few things that they've cut from the show, I haven't actually been able to see it yet, I'm still waiting for my copy to turn up. But if there's mistake or anything, it's all in there because the recording is just as it happened. I think people are prepared to see little mistakes here and there in the spirit and energy of the live performance. MR: Would you have a favorite song or songs from the DVD's selections? RT: I like a lot of the songs, but I think "Hold Me Up," "Crime Scene," and "Burning Man" are a few of my favorites. "The Money Shuffle" is another good one. That song is about Wall Street, particularly contemporary Wall Street, and the greed that exists there. I think in these times, that really will resonate with people. MR: Do you have any thoughts on the way that people are coming forward and challenging the motives and the way big business operates? RT: I identify with them totally. I think it's time for people to start speaking out about this type of politically engineered social injustice. This has to be resolved, and I believe it will be in the next 20 years. It might take that long, but it's going to happen. The income gap is too ridiculously wide. The middle class in America is particular being driven into poverty. This cannot be sustained. So many people that were formerly a part of the middle class no longer know how to classify themselves. It's called "not enough to live on and not enough to eat." MR: Beautifully put. You have had an incredible career, including being a part of the band Fairport Convention. What are your thoughts comparing Richard Thompson with Fairport Convention and who you've become? RT: That young naïve kid? I think that a songwriter-performer is in an interesting position because you're playing your own material every night, and sometimes, that's material that you wrote when you were eighteen years old. So, you have these more naïve and youthful songs that contrast with the older, more mature songs that you write as you go through the years. If a painter paints a picture and sells it to someone on the other side of the world, he'll never see it again. He doesn't have to reference his own work the way that a singer-songwriter does. It's a very strange position to be in. MR: You're also responsible for one of my favorite album titles of all time--Henry And The Human Fly. RT: I think that record is 40 years old this year. That's a very eccentric record. I would disown probably half of it. MR: (laughs) But it was fun at the time, no? RT: It was fun at the time. At that time, I was feeling my way through the studio and through being a songwriter. I think the vocals are really bad, but I do think it has an eccentric charm. MR: Of course, there'll have to be a deluxe edition since it's the 40th anniversary. RT: Well, no one's approached me about the idea. It could be the fact that the album only sold about 300 copies. Is it really worth someone's while to go through the work of repackaging it? I'm not so sure. MR: (laughs) Let's talk about your album I Want To See The Bright Lights Tonight, which is the album you recorded with Linda Thompson. That album is considered, well, a "classic." RT: I think that's a really good record. In terms of accomplishment, I think that's a record that stands up even today. It's well recorded and I think the songs are good. I stand by that one. MR: Richard, is there any advice that you would like to pass on to new artists? RT: Um, quit now? (laughs) No, no. It's a tough time to be entering the music business. I wish I had better advice or better news. I think your only choice is to be as original as possible, to somehow bring new ideas to the table. Nothing else will really work. MR: Do you feel that a new artist should be focusing more on creativity and originality than marketing oneself, or do they go hand-in-hand? RT: Well, I hate to say it, but something that seems to work for young artists is to do something outrageous on YouTube. If you do some sort of stunt video where you jump over Niagara Falls or something while singing your latest song, that works just great. (laughs) A few million hits on YouTube does no harm to your career. On the other hand, I think the artistic integrity route works in the end if you're willing to go hungry that long. It pays off eventually, but it might take people 20 years to notice you. MR: The Richard Thompson Band: Live at Celtic Connections includes a couple of bonus tracks including "Uninhibited Man" and "Johnny's Far Away," from the Cambridge Folk Festival. RT: That's right. The Cambridge Folk Festival is a tradition, it's been going for quite some time now, and it's a great festival. The songs that you mentioned are just songs that I really enjoy playing live. "Johnny's Far Away" is a bit like a sea shanty. It's nice because the audience can sing along, especially if it's a folky audience, because they get into the chantey spirit. The other song is about seeing a lot of people in the '60s and '70s die as drug casualties. MR: Very powerful. Richard, what are you doing in the near future? RT: I'm playing on a cruise next week, so that's exciting. It's called the Cayamo Cruise, which is a fantastic cruise around the Caribbean with a bunch of singers and songwriters. I did it last year and it's really terrific. I didn't realize that I was now a part of the cruise generation, but it seems to be that way. (laughs) Then I'll be in Japan in April and recording in May as well as playing a bunch of festivals in the summer. I can't really think too far beyond that. MR: All of the best, Richard, and thank you so much for joining us. Please come chat with us again soon.